I have been troubled white deposit of an aquarimu tank. 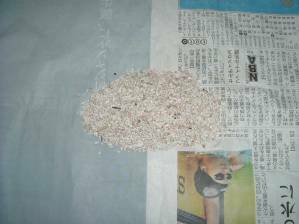 I had mixed two different gravels long time ago. 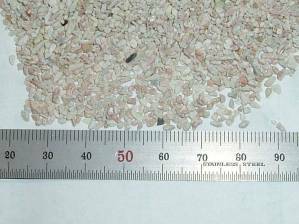 The photo "Half of stone" shows the dried mixed gravel. I doubt the white stone contains calcareous much. Tap water contains 0.2g/L CaCO3 etc in Japan by a site. The tank of capacity 60L contains 12g of solved substance at least. I shieved the gravel at first. 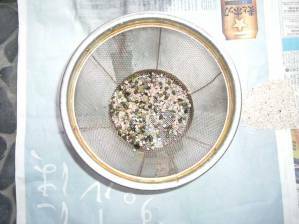 The sieve has mesh size 1.5x2mm (60x80mil) with distorted shape. 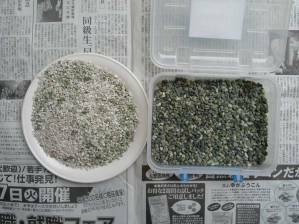 The cheap gravel for aquarium cracked, I think. It made the sieved flakes. 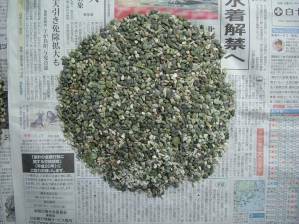 Next, I separated half of the shieved gravel by hand. Seperated good gravel are in the box. 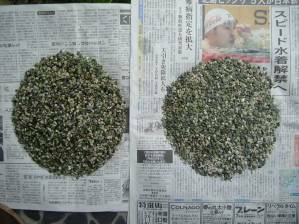 The diameter of the plate is 20cm (7.9"). I was tired of separation.